I first developed an interest in the Russian revolutionary Nikolai Bukharin after I read an account of his show trial by Fitzroy Maclean in his autobiography Eastern Approaches. There, Maclean describes how Bukharin runs rings around his prosecutors, who have tried to portray him as an enemy of the revolution, who plotted to assassinate Lenin and Stalin. These accusations were based on nothing. Bukharin was a loyal revolutionary. Someone who had spent time in the prisons of Europe as he attempted to build the organisations that could overthrow capitalism. Lenin thought Bukharin "Bolshevism's biggest theoretician". He was a leading figure, popular for his speeches and ideas. Some of Bukharin's early writings were particularly important. His work on Imperialism for instance, is still of great use today, and was recently republished. But following the isolation and defeat of the revolution, the growth of the internal bureaucracy meant that the Soviet Union travelled increasingly further from the workers state that Lenin, Bukharin and the other Bolshevik's fought for. Donny Gluckstein's political biography then looks at Bukharin's life in the context of this changing role. In particular he examines key debates in the years following 1917, and how Bukharin's ideas and arguments shaped those debates. Bukharin comes across very much as someone who is constantly fighting for the revolution and for a socialist society. However he often seems to lack the ability to know when to retreat or step back, or to put it more crudely, he sometimes "can't see the wood for the trees". For example the disappearance of money is something that would happen, it was argued, as socialism developed. But that doesn't mean that when money goes, socialism has been created. Economic collapse, the hoarding of wealth, the lack of availability of things to buy can also cause this. Bukharin was too busy arguing that this was a good thing, to be able to provide a coherent way out of the mess. The problem was, that the isolation of the revolution had created an almost impossible situation. At best, what could be hoped for was survival for a time when revolutions elsewhere would rescue Russia. This had been a real hope in the years immediately after World War One, when revolutions swept Europe. By the mid-1920s this was no longer on the cards. With the death of Lenin and the degeneration of the revolution, Bukharin lost the best influences upon him. All revolutionaries make mistakes, but their collective organisation helps correct and challenge this. Left to his own devices, Bukharin increasingly comes to represent the growing influence of other forces in society - in particular the rising bureaucracy and the richer peasants. In the great battle between Trotsky and Stalin, Bukharin becomes the best weapon Stalin has. His ability to articulate an argument, and his position as an old-bureaucracy, makes him a formidable weapon. Gluckstein traces the contradictions of Bukharin's position and shows how, as his use as the "hammer of Trotskyism" disappears, then he is next in the firing line. This is not an easy book. It assumes a good deal of knowledge of the inner dynamics of the Russian Revolution as well as the debates and discussions. Some sections of it are very dated. Bukharin is no longer lauded by many as the "third way" between Stalin and Trotsky, because of his perceived pro-market ideas. This was, it seems the case as an aging Soviet Union's internal contradictions started to come out. But Gluckstein does argue that Bukharin wasn't the enemy of the revolution that Stalin was. Bukharin's lack of theoretical clarity and, as Lenin argued, his lack of dialectical thinking meant that his mistakes could appear accurate but did not stand up to the test of events. But for all this, Gluckstein rescues Bukharin the revolutionary - a flawed revolutionary, but a man committed to fighting for a better world. more than simply another branch of industry. For those of us living in the developed world, the vast majority of us have little or nothing to do with the production of food, or indeed other crops. Today, those doing the farming work that feeds us all, comprise, in the developed world at least, somewhere around 5% of the populations. However, for the vast majority of human history and indeed for most of the undeveloped world, this is not the case. Most people were involved in the production of food, and in most historical societies, almost all of the work that took place within a community was related to food production. Mazoyer and Roudart's work is an examination of the history of agriculture - from the earliest hunter-gatherers who would have nurtured and protected plants, to the slash and burn cultivation that replaced them, through the various permanent "post-forest agrarian" cultures that saw the growth and strengthen of class society, to feudal and eventually capitalist agriculture. It is a monumental book, both readable and interesting as well as in depth and well researched. 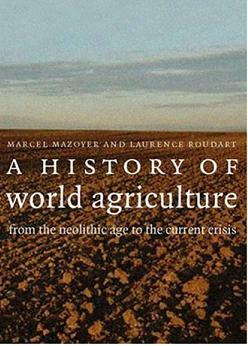 There is a temptation to see agricultural history as a linear path. Indeed my summary of the book in the previous paragraph makes that very mistake. But development of agriculture wasn't linear, though it did develop along definite paths and through particular stages. The reasons for moving from one form to a more developed form are complex and varied. Sometimes people didn't move on - which is why today there are still hunter-gatherer communities or people practising slash and burn cultivation. More developed agriculture is not necessarily easier work - though it will invariably provide a greater surplus. Nor is there necessarily a straight dividing line. Hunter-gatherers will have planted and harvested grains. Slash and Burn cultivators would have gathered nuts and hunted game. Often though, population pressures and growth were a key factor - in particular with the switch from slash and burn to more permanent agriculture. The authors document these processes, along with all the other factors to show just why the world of farming changed when it did. There is a wealth of technical detail - some of it obscure to those of us who've never seen a field of corn harvested. But what is fascinating is the way there is often repetition of tools and practises across many different continents. What is also amazing is the way some primitive methods still dominate - the simple scratch plough (the ard) still being used by hundreds of thousands today, even though it was replaced hundreds of years ago elsewhere. But this book is also part polemic. The authors are trying to explain why it is, despite technical innovation and cheaper materials, the "difference in productivity between the least efficient agriculture in the world, practiced exclusively with manual implements ... and the best-equipped and most efficient agriculture has increased dramatically. The gap has widened from 1 to 10 in the interwar period to 1 to 2000 at the end of the twentieth century". They continue by pointing out that "One third of the world's peasants, or more than 400 million of the working population, work not only with strictly manual tools but without fertilizer, feed for livestock, pesticides, and specially selected varieties of plants and breeds of animals". One billion people get their food from peasants farming like this. The root of this is of course wealth. The poorest farmers simply cannot afford to lift themselves out of the situation they are in, to obtain the most advanced equipment, fertilizers and seeds. They cannot compete against the cheaper priced crops from the developed world, and face sinking back into poverty and starvation. So the last chapters of the book look at alternate economic strategies to solve this problem. This is, I would argue the weakest section. The authors aren't naive enough to believe that simple controls on the import of cheap foodstuffs are enough to raise prices in the home market. But they have no other option. The problem is, that they aren't discussing agriculture in the context of capitalism - and the inherent power that the richest nations have over the poorest. Whatever rules may be created by a United Nations body, the rules of colonialism and imperialism will make the poorest pay. But these are minor criticisms of a tremendously important book. This solid investigation into the basis for human societies throughout the last 20,000 years is ammunition for those of us who believe a genuine materialist history of humans is possible. By examining in such detail different cultures and societies, we can put together an understanding of human development, and failure which will help us understand the enormous challenges for the future. 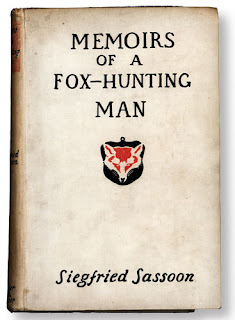 Part two of Sassoon's fictionalised autobiographical account of his early life reads much more lifelike than his earlier account of hunting and riding in the English countryside. 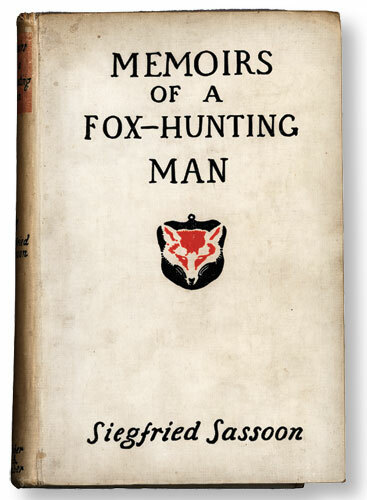 At the end of his fox hunting memoirs, we left him in the early years of trench warfare on the Western Front. Several of his friends and acquaintances had already died. Volume two begins slightly after the end of the first book. We find the author in the Army School, learning or relearning the art of open warfare that the military top brass keep expecting will appear soon, after the infantry in the trenches have broken through the German lines and more conventional war returns. Time and again we find this theme returns, as the soldiers prepare for a "big push" we learn how the cavalry is in reserve, ready to exploit the gaps that never open up. 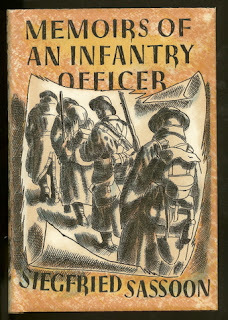 Most of the book though, is the tale of Sassoon's gradual awakening to the "wrongness" of the war and his growing desire to "do something about it". Sassoon is an officer, from a relatively privileged background. He believes, perhaps rightly, that if he speaks out, it'll count for more than the complaints of the ordinary infantry. What's fascinating though, is the way Sassoon is motivated by the apparent lack of understanding from ordinary citizens back home. Like many accounts of soldiers returning from home on leave, he finds himself unable to describe his experiences, or find comprehension amongst even military veterans. On the other hand, he cannot bring himself to talk about the reality of war. Even amongst other veterans or wounded in the hospital, there seems to be little discussion about the grim realities of the conflict, just long lists of the dead and wounded. Sassoon describes how he gradually decides to speak out. In part he can do this because, as an officer, when wounded his convalescence is far superior to that of ordinary soldiers. Staying in good hospitals and then country houses, he has time to read an think. He certainly feels little pressure to return, and when he overstays his sick-leave he is simply asked by telegram where he is. His eventual letter, speaking out against the war, is written by someone convinced he is speaking on "behalf of soldiers" everywhere. If this had been from an ordinary infantryman, I suspect that court martial would rapidly follow. Instead, with his rank and class background, Sassoon is argued with by friendly senior officers to withdraw, then he is offered a trip to a medical enquiry to check he is of sound mind. Eventually he agrees to this, as he finds that no one really wants to risk the embarrassment of a court martial. Sassoon's rebellion is influenced in a minor way by some anti-war activists and thinkers. But what really convinces him is the reality of conflict and the tremendous waste of the pointless conflict. It is clear that he is the tip of a much larger iceberg - around him it is common to complain about those sitting out the war, or profiteering from it, or enjoying it from afar. In other countries, notably Russia and Germany, these sentiments combined with growing lack of food and supplies to create a situation of mass rebellion and revolution. This didn't happen in Britain, though there were some major struggles. But its clear from Sassoon's account that the feelings of those at the bottom of the army were not differing greatly from those of the troops in the trenches a few yeards away. 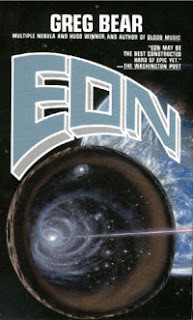 Eon - Classic SF "Big Dumb Object"
Greg Bear's classic science fiction novel Eon, is seen as one of the all time great novels of that genre. Part of its reputation must rest on the imaginative idea at the heart of the story. Just before the book begins, a large asteroid (which turns out to be an exact copy of Juno which is still orbiting around the sun) appears and enters orbit around Earth. Travels to the planet discover it has been artificially hollowed out and inside there are various enormous chambers, filled with relics of a civilisation. The beings who inhabited this civilisation turn out to be human and one of the chambers turns out to be infinite in size. So we have the setting for science fiction of the grandest order. Perhaps what also helped turn Eon into one of the great novels was the political backdrop to the tale. Written in the mid 1980s, Earth is still very much separated into two camps - East and West. The US dominated side gets to the asteroid first and gives the Warsaw Pact limited access. As time progresses, we learn that the planetoid comes from an alternate universe, or rather an alternate future, and it is in part the coming war between East and West that has led to its arrival in our own universe. This allows Greg Bear to play around with some interesting concepts - for instance how does knowing what you might do in the future impact upon what you actually do. Forearmed with this knowledge, can you change the timeline you are in. Its these sort of ideas that make the novel very readable. Sadly the characterisations of the people within the novel let it down - particular as Bear has some quite clunky dialogue between humans in places. As with so many of his fellow science fiction authors, Bear seems better at describing spaceships docking with each other than two humans making love. Eon is also limited by the time it is set. The Warsaw Pact countries didn't last much beyond a few years after the book was first published and this makes some of his future history particularly unbelievable. Sadly, once again, being a scientific visionary doesn't necessarily mean you can see even a few years into the real future. Oddly enough some science fiction written many years ago, dates less than some novels set during specific periods of human history. The cold war seems to date novels (and not just SF) far more than other events. But Eon is an interesting book. I particularly liked that Bear didn't simply go for a happy ending. It would be too tempting, when your key characters know the future, to allow humanity to escape their fate. I did notice, what I thought was one large plot hole, but that's probably because I spend too much time worrying about alternate universes. Having said that, a look at the plot descriptions for the various sequels doesn't inspire me. Perhaps some of my readers might want to suggest whether the follow-up novels are worth the effort.